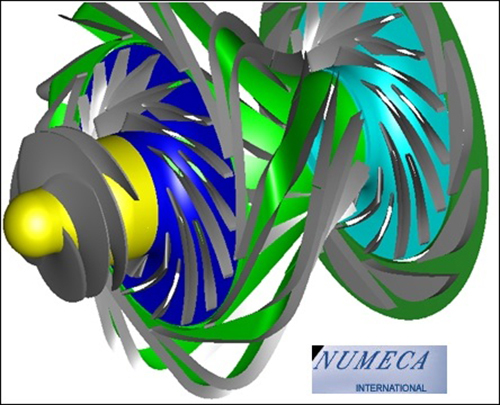 FINE?/Turbo is a fast and accurate Flow Integrated Environment available for the simulation of internal, rotating, and turbomachinery flows, and this for all types of fluids. FINETM/Turbo integrates a fully hexahedral, highly automated grid generator, AutoGridTM, advanced density-based numerical algorithms with local preconditioning. The package is completed by CFViewTM, an advanced visualization tool. Users pilot FINETM/Turbo through an easy-to-use and intuitive interface for fast solution set-up, or through a batch process for transparent integration in a design cycle. FINETM/Turbo contains features for multiple blade rows and steady or unsteady interaction. Different levels of approximation are available, depending on the nature of the phenomena and the frequency spectrum to be captured. The non-linear harmonic capability allows significant speed-up for single and multistage unsteady analysis. The table on the right shows figures for a single stage radial turbine, computed on a single processor (3 harmonics have been selected). FINE/Turbo brings major improvements to the rotor/stator interaction. Multi-row phase-lagged and non-linear harmonic techniques are available. From left to right: centrifugal impeller phase-lagged calculation (courtesy GARRETT) - 4.5 stage axial compressor, non-linear harmonic module (click to animate, courtesy Rolls-Royce DE) - comparison of CPU and RAM used. FINETM/Turbo's fully hexahedral technology yields accurate and reliable results. Its multigrid engine ensures an extremely fast convergence rate and low memory consumption for large number of grid points. FINETM/Turbo accepts very large aspect ratio cells (up to 5000) and low Reynolds number meshes for an optimal capturing of viscous and turbulent phenomena. FINETM/Turbo covers a large range of applications, such as multistage axial, radial, and mixed-flow compressor, turbine, pumps, fans or propellers, and their industrial counterparts such as volutes, diffusers, heat exchangers, and exhaust systems.